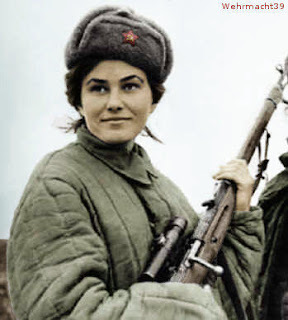 Otherwise known as Lady Death, Lyudmila was a Ukranian Soviet sniper during the Second World War. She was creditted with 309 kills, making her the most successful female sniper in history, and one of the top military snipers of all time. Her hobby before the Second World War was shooting, and in 1941 she volunteered for the infantry, being assigned to the 25th Rifle Division, where she became one of 2,000 female snipers in the Red Army - only about 500 of whom survived the war. In 1942, she was wounded by mortar fire, and taken out of combat. Instead she was sent on a publicity tour of the USA, meeting President Roosevelt (the first Soviet citizen to be recieved by a US President). Woodie Guthrie wrote a song about her. She also toured Canada, where she was presented with a Winchester rifle which is now on display in the Central Armed Forces Museum in Moscow. In the UK, she visited the cathedral ruins at Coventry, and several factories in Coventry and Birmingham, and collected over £4,000 from Coventry workers to pay for three X-ray units for the Red Army. Back in the Soviet Union, she became an instructor, and trained snipers until the end of the war. In 2015, a film of her life was made, called Battle for Sevastopol ("Unbreakable" in Ukranian), and her portrait has also been used on Russian postage stamps. She died in 1974 after a career as a historian.